Bad Ice Cream 2 is nitromes' sequel to their arcade action game that features flavored frozen treats. Your goal in this game hasn't change from the original game; nab all fruits on each level which is apparently full of enemies. 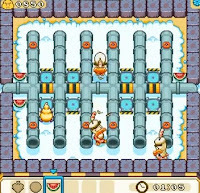 Smash ice and and get all of the fruits before the level ends. The challenge is avoiding the enemies with ice cubes that you can magically spit out but be sure you use this skill to your advantage. Meanwhile, here is Bad Ice Cream 2 walkthrough showing how to beat each stages including the final level.